His name . . . Spangler Arlington Brugh. Yeah, I know. Who in their right mind would hang a name like that on an infant? But, they did. I met Spangler as a freshman in Beatrice High School. That’s in Nebraska. It was 1927. Our affair would last three years until he graduated in 1929. 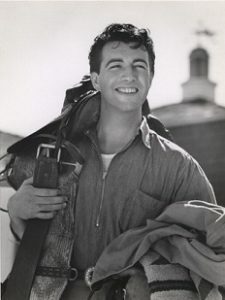 It was several years later I learned his name had been changed to Robert Taylor by his Hollywood employer. His fame as an actor grew fast, far, and wide as did my melancholy for him, my first love. He loved Nebraska and came back as often as he could; always making a point of stopping by to say hi to me and Kadar who had grown into a beautiful Arabian stallion. Kadar, which means powerful, always remembered Robert in spite of his long absences. He would whinny and rear up at the sight of his old friend. It was heartwarming to know I wasn’t the only one who missed him. The affair was over, at least for Spangler, even though he often hinted he regretted letting me go. It was some comfort to me, but too late for him. He was in the grips of the Hollywood moviemaking machine and all that it entails. Even though he may have wanted to, I can see now it was impossible for him to break away. It was some consolation that he never forgot the nickname he gave me when Kadar was born. He looked up at me over the struggling new foal and whispered “Habib,” and kissed me. Habib means beloved. He was on the high school track team and always fit as a fiddle. I never saw him smoke cigarettes or indulge in alcohol. Those habits overtook him later, during his life in Hollywood. They not only eventually robbed him of his beautiful face but put him into an early grave. When I learned of his death, I grieved for the longest time even though I had not held him or made love with him in decades. I guess that’s the way it is with first loves. You never forget. Wherever he is now, I hope he’s happy and looking as beautiful as ever. I had only been in high school a short time when I happened to see him at the track field, practicing with his teammates. When they finished their workout, they sauntered over to the bleachers where I was sitting; their bodies glistening with sweat as they passed by, Spangler stood out from the rest of them because of his clean-cut appearance. I remember thinking I would have given anything for one drop of his sweat on the tip of my tongue. When he looked at me and smiled. I think my heart skipped a beat. I smiled back as the group moved on to the school building. I saw him occasionally in the hallways between classes, but never close enough to say something, though I don’t know what I would have said given the chance. The cafeteria was a cliquey place, so there was no chance of getting close to him there either. I was so taken with his presence, I opened my mouth and no sound came out for a second or two until I heard myself return his greeting. Then my throat closed up and I was sure I’d never speak again. We said nothing during the rest of the hour but I did sneak peeks and found his profile so beautiful I kept looking until he caught me. He smiled and went back to whatever it was he was reading. We laughed and then I asked him what Arly was short for. “Great.” He disappeared in the crowd. What he didn’t tell me was . . . where we should meet. “Home, I have chores. We have horses. Wanna come along? I’ll bring you back into town.” The ‘oh, my God’ look on his face was a surprise. I would find out later why. His eagerness to help care for the horses pleased me; it would be an excuse to have him around. What surprised me was his intuitiveness. He seemed to know exactly what needed to be done with each animal. I could see Mother was charmed by him and was not surprised when she invited him to stay for supper. He refused but hoped for another invitation which, of course, he got. And, it was during one of these occasions he mentioned Gyp. I asked him who Gyp was. It was Gypsy, a pony he once owned when he was young. There was a sadness about him when he mentioned it so I decided not to press him for more information. The information he did provide told me why he was so able with our horses. He spent so much time on the ranch, I wondered about his personal life at home. He never offered any information and I didn’t ask. He seemed happy to be working around the stables, and so was I – just to have him there. He never said anything but I could tell, so I asked if he wanted to go riding. The look on his face was priceless. Of course, he knew exactly what to do. We went riding together so often, our friendship grew into a closeness I imagined one would only have with a brother. His sense of humor and playfulness captivated me until I realized I was falling in love with him which scared the bejesus out of me. The thought of him discovering my feelings for him put me on guard. I was careful about everything I said or did around him which became a burden I did not enjoy. That ended the day he grabbed a horse blanket and climbed up into the hayloft. I wasn’t sure what he was up to, so I just stood there watching. He disappeared for a minute and came back to the rail. “Come on up.” He had already taken his shirt off and was smiling at me in a way that startled me. “I love being here, Nick. I love the horses. I enjoy being with you, and I love your mother’s cooking.” We both laughed. He laid back on the blanket and put his arms behind his head and sighed. I managed to get my shirt untucked and unbuttoned but that was all. We laid there talking about everything horses until the dinner bell rang. The whole experience was so innocent, his real feelings for me did not become evident until about a month later when we adjourned to the loft for a rest. He had been so quiet that Saturday afternoon, I figured he had something on his mind. We climbed into the loft and settled on the blanket fully clothed and laid there a few moments. I could feel the tension but didn’t know what to do or say. He finally rolled over next to me, put his arm across my chest and whispered, “Nick, I care about you,” and kissed my cheek. My insides exploded as I wrenched around and our mouths collided. I had heard about passion but had no idea what it was like until that moment. As we ripped each other’s clothing off, his scent and strength so overwhelmed me I began to pass out. I grabbed him and pulled him into such a tight embrace he began to gasp. I uttered a feeble “No.” and we proceeded to consummate our relationship. We cleaned up and I let Arly go to the house first. Dad had some bad news – his distant brother had passed away. This turned out to be a great cover for Arly and me. The dinner unfolded with all of our attention focused on my departed Uncle Ted who I never cared for. He was a free-loader and took advantage of my dad’s generosity. It was a perfect out to have him around as often as possible. We both worked harder and played harder. Making love in the hayloft became a little bit of heaven for both of us. But it was not all roses. A pretence had to be kept up to avoid any rumour about us developing into a mess neither of us wanted to face. We never spoke to each other during school hours. Spangler reluctantly continued dating various girlfriends. Sometimes, after one of those dates, he’d rush out to the ranch and we’d meet in the hayloft for our own goodnight kiss. He spent a good deal of his time participating in other school activities which I wasn’t interested in. As we entered into the latter half of his Senior year, I became more and more aware that he would be free to do whatever he wanted to do after graduation. He usually avoided the subject and was vague when I pressed him. There wasn’t much else I could do except wait and see what developed. I heard a rumor that some talent scout had seen Arly at a sporting event and had spoken to him. He never mentioned it to me and I held back from asking. Arly came to the ranch less and less as the end of the school year and graduation approached. I didn’t attend his graduation with the assumption we would see one another the following day. That day and many others came and went with no word from him. I felt so abandoned and lonely it’s difficult to describe. Not a phone call, not a letter . . . nothing. Had everything we’d been through meant nothing to him? Several months later I heard he had gotten a job at one of the Hollywood movie making companies and had moved to Los Angeles. I was half tempted to contact his parents to get his address but decided against it. He knew where I lived. I couldn’t bear the thought of writing and not receiving an answer. About two years later I was in the lower 40, mending fences when I heard Kadar whinny repeatedly which was unusual for him. I raced up to the stables and there was Arly, up close and talking to Kadar. I stood there a moment watching until he saw me. He apologized for not calling ahead. His visit was a spur of the moment. He was passing through on his way to a location site where a film was being made . . . some western sage. His excuses seemed flat and insincere – not like the Arly I had known. I was cordial but so hurt by the lies he was telling me, I had little to offer the conversation. Finally, he looked at his watch and said he had to go. I thanked him for coming and said he was always welcome. He was so changed from the man I had known, I didn’t care if he ever came back. As he drove away, I realized the love and affection I had for this man had survived, but now there was the pain of knowing it would never again be. He did visit a few times but they were awkward. Kadar passed away before Arly’s last visit which was the only tie we had to the past. He never visited again. I thought I was over him, but as the years passed and I saw the effect the Hollywood moviemaking machine was having on him, my melancholy returned along with the helpless feeling of knowing there was nothing I could do to rescue him. The thing that struck me most – he never seemed to be without a cigarette in his fingers when being photographed. The effects of smoking became evident as it robbed him of his beautiful face. I often wondered what possessed him to grow the moustache which did not add to his looks – at least in my estimation. When I read about his lung cancer and the removal of one lung, I groaned at the pain and unnecessary loss he must have suffered. Less than a year later, the news came that he had passed. For some reason, I didn’t feel anything. It just didn’t register that he was gone until a few days later. I climbed into the hayloft and wept bitter tears for the loss of the man I never stopped loving. It’s hard to believe he’s been gone half a century already. But to me, he’s still the vibrant young man who loved riding horses and making love to me in the hayloft over the stables. His scent, mixed with that of the horses, is still vibrant in my mind. A few days before Mother passed, she told me she knew about my relationship with Arly. I remember sighing and asking why she hadn’t said anything. The wisdom of her years simply put it this way, ‘You were so happy, saying anything didn’t seem to matter.’ I asked if Dad knew. She laughed and said, no. 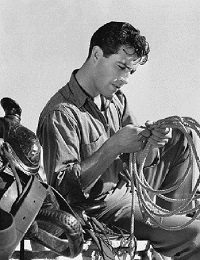 And that was the affair I had with Spangler Arlington Brugh also known as Robert Taylor. Thank you for reading this story. This link will provide you with the only recording of Taylor’s singing voice. He was 25. The trigger is in the upper RH corner. Cheers. "This Side of Paradise: Chapter Eight"
"The Beautiful and Damned: Book 2, Chapter 3: The Broken Lute"
"Our Mutual Friend: Book 2, Chapter 4"